Start a the top with the school board: All policies for school districts are set by the board of trustees. The administration takes their directives from the school board. If you can get the school board’s support, your schools will go green. 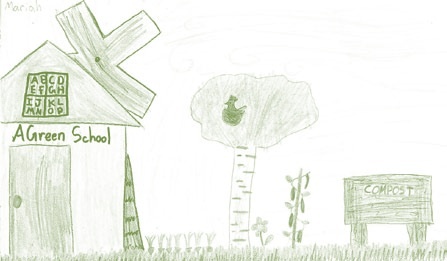 Compile a packet of information on the benefits of green schools and submit it to the board. You may look to other schools or states as models, such as New York requiring the use green cleaners, and New Jersey requiring all new schools be built according to LEED standards. OCA also has materials available you could use, and Green Schools has a sample school board resolution. Have parents write letters supporting these changes (letters are more effective than petitions). Request to have an agenda item listed, then organize a presentation with parents asking the board to adopt a green schools policy or resolution. Work your way down the school’s hierarchy: If you can’t get support from the school board, go to the site’s principal. If you can’t get the principal’s support, go to your child’s teacher, etc. Don’t forget the teachers’ union, as they may include in their contract negotiations a reduction in chemical exposure, etc. Get other parents involved: Almost all schools have some sort of parent/teacher organization. This group is a great place to get the ball rolling on anything from a school garden to a recycling project. You can even organize a “Green Team” of parents, students, and community members. Do it yourself: When all else fails, as a parent, you can help your child’s school go green. Provide organic snacks from your garden for the classroom, volunteer to run a recycling program, organize a fundraiser to buy more eco-friendly products, etc. I have even gone so far as to buy organic fertilizer for our school’s lawn, as well as natural dish soap for the kitchen. Involve local businesses: Local businesses love to support schools, even natural businesses. Food Coops can donate goods, as well as make great destinations for field trips. The local recycling center is another fun trip that usually results in the children clamoring for school-wide recycling project. Our recycling center allows parents to donate their recycling funds to the school. The possibilities are endless when you get involved with greening your local schools. Instead of worrying and complaining, I find getting involved a good remedy. It is frustrating at times, and I wish more changes would be made, but I keep trying.